In the area of Grotta, one of the most beautiful areas of Naxos, you will spend the most unforgettable moments of your life. From the verandas of our apartments facing the old town, you will discover the temple of Apollo and enjoy the unique sunset over the infinity of the Aegean sea and its constellation of beautiful islands like Paros, Tinos and Mykonos. At the edge of the town you will enjoy holidays as never before in a place with family atmosphere, warm, friendly, hospitable, clean and very quiet. 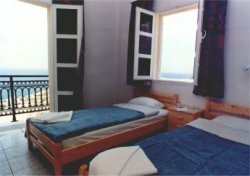 Room with large veranda, sea view, fridge, kettle, TV, Air Conditioning, Bathroom. Room with balcony, castle view, bathroom, Air Conditioning, fridge, kettle, TV. Apartment with living room, fridge, kettle, TV, sea view from balcony, bathroom, fan. 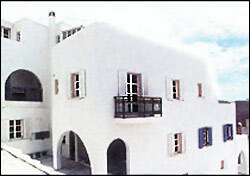 Apartment with self-catering facilities, one main rooms plus living room, bathroom, independent heating, TV, fridge. (1-5 people) Can also be rented monthly. Room with bathroom, TV, self-catering facilities. Monthly rental only.